A series of quick-hitting storm systems will continue to move across the region through the weekend. 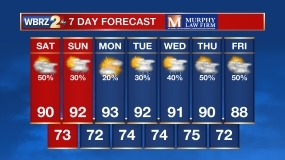 This means you can expect rain every, other day. Today and Tonight: Morning clouds will give way to sunshine on Thanksgiving. Temperatures will remain just a touch below average with highs in the mid 60s. Some clouds will advance into the region overnight with light east winds and lows in the mid 40s. Up Next: Shoppers should enjoy cool, dry weather through Friday morning but late in the day, a more potent storm system will track through southeast Louisiana with widespread rain and isolated thunderstorms. A solid half inch of precipitation is expected for most, most of which will occur during the afternoon and evening hours. After a break on Saturday, another fast moving storm system returns showers to the forecast on Sunday followed by much cooler temperatures. Cool, quiet weather is then expected through Wednesday. 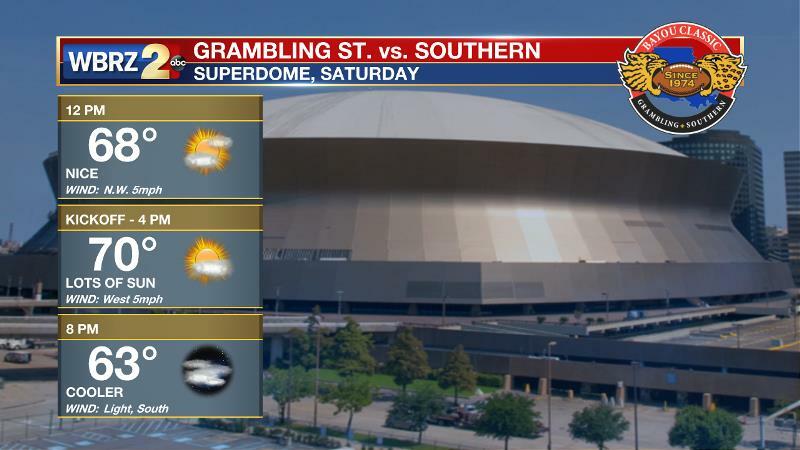 Football Forecasts: Both the Bayou Classic and the season finale for LSU will enjoy quiet weather on Saturday. In New Orleans, a partly sunny and seasonable day is expected with pre-game festivities enjoying temperatures in the upper 60s. For College Station, the Tigers and Aggies will kickoff to a temperature in the low 60s beneath partly cloudy skies. The Tropics: With just under two weeks left in the official hurricane season, all is quiet. No development is expected in the Gulf of Mexico, Caribbean Sea or Atlantic Ocean. After negative vorticity advection allows the area to clear out on Thanksgiving, the next in a parade of shortwave troughs and vorticity maxima will approach the area late Friday. A surface low will develop in the baroclinic region east of Brownsville, Texas and eject northeastward through the central Gulf of Mexico. The surface low will likely move along the Louisiana Coast toward the Florida Panhandle, therefore keeping most instability south of the state. As a result, severe weather chances will be minimal as a batch of rain and embedded thunderstorms moves through. Rainfall of about a half inch is expected, mainly during the afternoon and evening hours. Another lull is expected to begin the weekend. Then finally, the strongest in this batch of shortwaves will move across the center of the country on Sunday. With a more pronounced surface low expected to develop and move across Missouri, the trailing cold front will move through the area sometime late Sunday. Normally, this would pose a threat of severe weather somewhere in the lower Mississippi River Valley, but current indications are that moisture availability could be an issue. Much cooler air will arrive behind that boundary on Monday and last into the middle of next week.